"All of my projects have come out perfectly." "We don't make ugly models here." Those were a couple of the replies I received when I sent out the latest FTW Collaborative post. I wish I was that good. We've seen the best, everyone posts the good stuff... but what about the the bad stuff? Those modeling and painting experiments that went completely wrong, the stuff you would never show to anyone ever. Time to share some of those. Bone, as I quickly discovered, wasn't the easiest nor fastest thing to paint. At times I would be very patient and be able to add depth to models to make them at least half-way decent... read the full post. Some of my oldest stuff like my first Terran Hands Space Marine Chapter. Talk about gaps in the paint, yellow not covering and leaking onto the red and just generaly a terrible paint job. Not even paint by numbers quality. For me this this is a little hard to scrape up and talk about. Not because I think my stuff is great, I can always improve how I do things... the day I think I can't learn something... read the full post. Oh, the shame....I'm far, far, far too embarrased over it to post pictures (plus, I haven't got a camera) so you'll have to take my word for it. I had tried to paint it in the Sa'cea colour scheme, and, after an awful job on his robes... read the full post. While trying to create a 40k scale Model for horus, I sliced my thumb almost off. 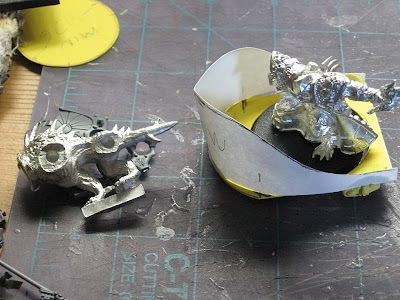 I don't have a picture, but using a hobby knife to drill out a head of a pewter model was not the best idea to begin with. Add in the distraction of a rambunctious dog, well half of my thumb felt the pain of that manouvre. The worst mistake I ever made on a model was using too much paint. It was the captain model from the Assault on Black Reach, I primed it black... read the full post. So here is my disastrous Tarzan. The fact that I gave him purple hair... read the full post. Well here is a pic of one of my first paint jobs. Not pretty and I do keep it around... read the full post. My worst mistake was some 12 years ago, when I first got into WH40k. I had bought a few squads of Space Marines destined for crummy paint-jobs as Dark Angels, when my frustration at the cost of the minis struck what would be a horrible decision: I would sculpt my own magnificent Space Marine models out of a giant block of cheap common clay! (let me state right now that I am no mini-sculptor) The resulting models were not only miserable hybrids of Space Marine and the Michelin Tire Man, but crumbled to dust upon drying anyways. All photos of the doomed project have been ritualistically burned, their existence now only myth. Well I have dared to open the draw of forbidden and terrible (not in the onimous sense) miniatures and unleashed them... read the full post. During the time I was creating my Daemon Hunter Inquisition, I decided to make a greater daemon in any case I fight another Daemon Hunter. I put together an Old One Eye model, a Balrog model and a ringwraith on fellbeast model. At first the idea was good to make a flying monster. It was a disaster. I would post picks but I dismantled the beast and created their respected models and sold them off. That is when I learned that not all conversions are good conversions. Though I can say over the years I have made more errors then I will often admit, I have to say that my worst overall modelling mistake was with a Forge World Chaos Warhound Titan when they very first came out. I have one of the first 100 and I made the mistake of gluing the shin pad into place before painting the underbelly part of it. Once I realized what I had done later that day, I tried to remove it, but in the course of doing so broke the pad and part of the pieces under it. I never painted the flock and even used the base color as the color for the clothing... read the full post. 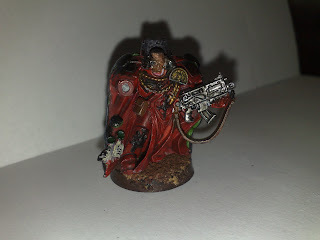 ... rummaging through my painting box I did find my Blood Angels Captain, which I suppose is technically the worst example... read the full post. Early in my gaming youth I was told one could "strip" models of paint then start anew. I remember seeing my sister's fingernail polish remover and thought to myself, "hey that could work!" I immersed my 2nd Ed. plastic Ork models into a jar of the nail polish remover, gave it a few swishes and placed it under the sink in the kitchen. I took a look a few hours later and found a melted slag of plastic Ork boys, reminiscent of the dog scene from John Carpenter's The Thing. I've only been in 40k a year, so I have little track record. But after finishing painting my first 9 models (a group of UM Terminators) I used some quickshade and then my Spray-on Anti-shine Matt Varnish. With the Matt Varnish I used a little too much... Needless to say I sprayed it on like primer and the results were a frosty looking Terminator. Thankfully I only did this one 1 model before I tried it on the rest. So out of my Termi Squad I have 8 nameless dudes and 1 named Frosty. I thought about stripping him and starting over, but he was my first finished model and my first mistake. So I decided to leave him be. Long live Frosty! Also, last night I went to find some images for this post at my parents house, where I've left all of my LOTR models due to space... read the full post. I've never been a master of modeling and model painting. 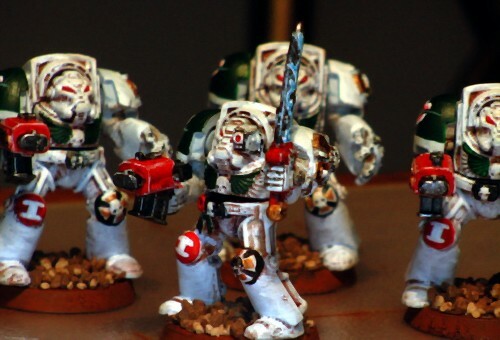 That's why I've chosen black primer for my first Deathwing Squad... read the full post. So one night I decided to make me a thunderhawk gunship, just for the fun of it. I bought a lot of material from my local crafts store including a lot of cardboard, I can assure you I have A LOT of cardboard in stock…… So with good hope, I started gluing the freshly printed templates onto the cardboard using kids glue (90% water I found out later) and as you might have guessed, the cardboard, the glue and the paper didn't mix too well giving me bent templates. Stubborn as I am, I decided not to scrap the project but to continue, resulting in a verry crappy looking soon to be scrapped Thunderhawk. 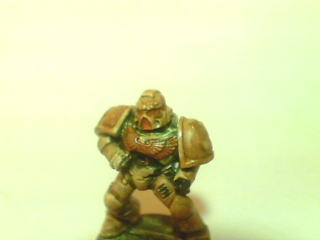 I tried the same colour scheme as my tyranid carapace method, I tried to give him a rottting-bone look. It did not work at all. I can't even find some of the other parts for this AoBR marine. While all these factors may sort of excuse the poor quality of the miniature, there is one thing I repeatedly get criticism for: the leftover flashes from the casting process. I am simply too lazy to file them off... read the full post. As you probably can not guess, this is my Space Wolves Wolf Lord with the Mark of the Wulfen (the old codex). Indeed, the initial goal was to have a lord with a wolf skin... read the full post. This is one of the old plastic Dark Elf Witches, and as you can see I decided to use cheap and nasty undercoat. This did horrible things to the plastic but I was, in my impetuous youth, determined to paint it anyway... read the full post. And I'm going to throw my two cents into this one. I think one of my biggest failures recently was attempting to build a chariot for the Skulltaker project I had a while back. I say this project because it had such a different ending, but when I first attempted it, it was nothing short of an epic fail. You can read about the whole project here. Thanks for sharing you "worst" models guys, it's always fun to look back and see where we started and just how far we've come with the hobby. If you sent me your stuff (and all the info was there) but you don't see it posted here, just send me an email and let me know and I'll get it added. Man if that is the worst of FTW, I really need to give up this hobby and go back to gardening this winter. And I thought my standards were high. 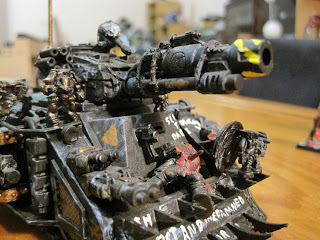 I have a painted Leman Russ which Reece wouldn't even use in unpainted, proxying Apocalypse games. The way to get better at anything is to look back and admit your past mistakes and learn from them to become better. 40k is no different. Those that said the made perfect models and such seem incredibly arrogant and conceited, honestly. Thanks for making this collabrative post, Ron. It was very nice to go back and see how much I've progressed over the years and it is nice to see the same of others as well! Haha... my WORST... :) It was an experiment with blending. I decided I would go from Red to Green and blend the whole way on a Lost and the Damned Tzeentch Basilisk. Well... the execution wasn't all that bad. I went from Red to Orange to Yellow to Green. The blending looked pretty decent while I was doing it. Then a set the model down and took a step back... Holy crap was it ugly! It looked like a retarded 'Gay Pride' tank. While I still enjoy blending, I've decided to limit my range just a bit. I've still got 90% of everything I've ever painted, including my RTB01 beakies in Dark Angels colours. I like looking at them as what they they lack technical skill (to be polite) they make up for in enthusiasm and zanyness. It helps remind me what I love about painting and the 40k hobby, as well as giving me a boost to see how far I've improved over the years. I really wish I could find the first marine I painted. He is really hella bad. I agree with Gott it is great to look back at what you have done because there are some old techniques they might remind you of that you may just have forgotten to write down, by the same token this is the same reason I have a big stack of old White Dwarf Mags and Codexes. I wish I still had some of my older models to show off... I had a RTB01 beaky who was a god-awful shade that looked somewhere between mustard and baby poop, and the paint had cracked like old mud. Absolutely hideous. Sadly, nearly all my models from before '02 (I started in the mid 90s) have been lost either through my own moves, my parents moving, or my ex-wife "getting rid of some old junk". I shall shout before every battle now: LONG LIVE FROSTY! Kudos to my friend Werner who left a post here, we're the group from Guatemala, a small knit community but slowly growing.